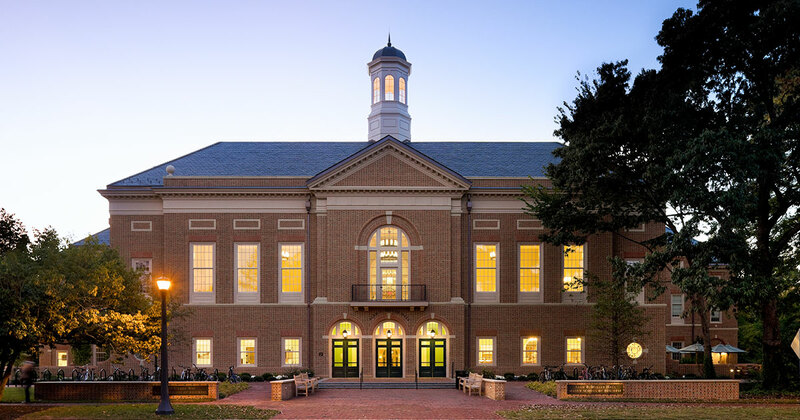 Earlier this month an honorable 85 graduate students at the Raymond A. Mason School of Business at William & Mary were inducted into the worldwide Beta Gamma Sigma Honor Society for excellence in business education. The graduate students heard from one of our very own MBA students, Karen Jackson '91, who eloquently stressed the importance of a service mentality and the relentless pursuit of knowledge. She urged the honorees to be open and resilient, telling them "you're stronger than you think. There will be tough days, there is absolutely no doubt that you will have them - everyone does, but you will pull through. They'll be hard, but you'll make good choices, but always make those choices based on the lessons you've learned here." Ms. Jackson was proud to welcome the newest inductees into the ranks of such a time-honored tradition. Jackson, currently the President of Apogee Strategic Partners particularly stressed one piece of advice: "continue to learn, continue to be hungry for knowledge, and continue to be hungry to embody the service mentality that you gained while you were here at William & Mary." "Don't ever think that the day you walk out of this institution is the last day you will learn," she said. "Continue on that journey - each and every day, learn something new." The 85 graduate students have distinguished themselves through outstanding academic performance and achievement in the study of business and management while at the Mason School. They rank in the top 20 percent of their graduating class. Founded in 1907, Beta Gamma Sigma is a global network of more than 830,000 lifetime "Best in Business" members spread across more than 190 countries. The scholastic honor society is dedicated to principles and ideals it considers essential to living a worthy life and pursuing a commendable business career. It connects students from more than 599 collegiate chapters worldwide. William & Mary's chapter was formed in 1973 and has recognized more than 2,200 graduate and undergraduate students. The honorees, along with their friends and families, sat in the pews of the historic chapel in the Wren Building. Professor William Stauffer, Clinical Associate Professor and faculty advisor of Beta Gamma Sigma, stepped up to begin the ceremony. "Look around you," he told the students. "This is the best of the best." Three professors, Debra Hewitt, Alexander Woods, and James Bradley, explained the meaning behind the letters of Beta Gamma Sigma: Beta signifies honor, Gamma stands for wisdom, and Sigma represents earnestness. The importance of the ceremony and the event were not lost on the students. It was a beautiful event wrought with energy and pride. As the near-spring evening eclipsed the service, students retired to the Great Hall for a reception and a glorious sunset upon the Sunken Garden. Hosting Beta Gamma Sigma's Ceremony in the Wren Building continues to build upon the heritage of our great nation and furthers the story of our incredible legacy. Congratulations, inductees - you are each a part of this tradition.